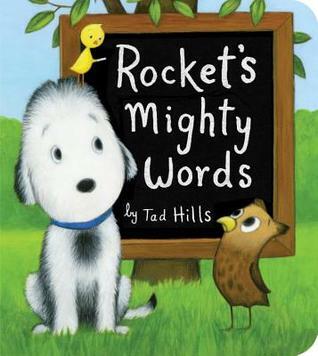 (early e-ARC preview from Edelweiss)We LOVE Rocket at our school ... both of the first two. This one continues the tradition of super cute illustrations. I was a little disappointed as I looked over the preview but that is probably because I didn't read the description closely before I requested it. I just saw ROCKET and I thought "Oh, I definitely need to see this! "I like the board book format. If it's meant to be a "reference" book so that little ones flip back and forth figuring out how to spell things it will need to hold up to wear and tear.I have to disagree a bit with the description, though, now that I have gone back over it. Still nowhere do I get the real idea that it is basically a visual dictionary. And sharing during storytime? Laptime (ie with a parent), maybe. But in a class setting with a group? Not enough content. More like a book the teacher would place at a station to help the kids figure out how to spell words.Would be AWESOME if you could include an educator's guide online ... maybe with some of the pages in b&w reproducible format? So that students could practice labeling some of the pictures?So I guess this is what I'd say. I would totally recommend this as a resource to teachers, and maybe to parents of kiddos who have expressed interest in Rocket who are also learning to write ... but I do not think that I will be getting it for our school library collection. Weird selection of words, and strange presentation with alternate pages showing a blackboard, vs. the cute dog pages. Rocket is adorable and I want him. I read this to my little sister. To know something's true name is to have power over it, mystics have long believed. Ancient beings held their true names secret, fearfully protecting themselves from terrible fates.Naming something drags it from the realm of the unknown to the known. You're then easily able to break it down, pigeonhole it, tame it, and harness it for your own ends.In this tome, Rocket shares all of his words of power. Learn mastery over the igloo, ax, mug, and pumpkin. If you like Rocket's other books you'll enjoy this one, however, it's important to note that there isn't a story in this book. It's simply a collection of words that have appeared in Rocket's other stories. All of the words are either on top of the illustrations they name, or next to the pictures would could make learning new words easier for early readers who are visual learners. Fiction-2013Part 1 or 3. This book introduces the kids to new words and pictures that will be used in the next two books. The pictures are good and these books would be great to use with beginner readers and writers. Perfect little book for my two year old! Join Rocket, an adorable puppy who loves to read, and learn 100 first words. The pictures are easy to identify and the font easily legible. Perfect for brand new readers or younger ESL students. Some pages have too many images for younger kids. Learn many words together and also some "small" words that are needed. Cute book!! All of my kids got a free book from the library summer reading program, this was one of them!!! So thankful, gotta love the library! Whoo-hoo - twice in one day an oversize board book!! In the traditional style of Tad Hills this book has nice soft colorful illustrations. Children learning words can browse this cute book. The format of this one didn't really work that well for me but this would be nice for a new reader to flip through at their own pace. Love the pictures of Rocket, but this is just vocabulary words and not a story. Some of the chalkboard illustrations are indistinct. Tad Hills - “Whenever I picture myself [as a child],” says Tad Hills, “I am doing art. I spent a lot of time on my own making things, drawing, and painting.” Hills was not consciously trying to become an artist, rather his motives were innocent and pure. “I liked making things,” he says.As a graduate of Skidmore College in New York with a degree in art, Hills describes himself as the ultimate freelancer. He’s done some acting, made jewelry, makes fake teeth for stage productions, dabbled in interior renovation, and illustrated book jackets for adult trade books. But Hills’ break into children’s publishing coincided with his wife Lee’s new position as the art director for Simon and Schuster’s children’s book division. “Lee used to ask me to try illustrating some books she couldn’t find an illustrator for,” Hills says. When Lee moved to Random House to start her own imprint with long-time friend and associate, Ann Schwartz, she encouraged Hills to write his own picture books. “I started with four stories,” says Hills. His break out book, Duck and Goose (Schwartz and Wade, 2006) was one of them.The idea for Duck and Goose started with only a title—The Silly Goose, the Odd Duck and the Good Egg. As Hills developed the story, he realized his egg would have to be rather large to support Duck and Goose so they could hatch it. Hills also had to consider what would hatch out of such a large egg. A dinosaur? An ostrich? Additionally, Hills floated the title by his son’s kindergarten class and was rewarded with blank stares. Hills took the hint and changed his egg to a ball, and changed the title.“For me, the writing is really difficult. I stare at a blank page for hours,” he says. “When Lee comes home and asks me about my day, I say it was okay. I wrote one sentence. . .But when I’m in the zone, I literally hear the dialogue between [Duck and Goose]. They were telling me what they wanted to say! That is the best feeling. That is when it’s not work. It’s fun!”Hills paints with water-soluble oil paint on paper, using colored pencils for the last details. Although Hills’ Duck and Goose characters look simple enough, he drew hundreds of ducks and geese before finding a style with which he was comfortable. “The first ones [I drew] were older looking,” he says. “They looked like cigar-smoking tough guys.” Over a matter of months, Hills finally pared down Duck and Goose to their essential elements—circular heads, long rectangular legs, triangular feet, and door-shaped beaks. “When I apply the eyebrow,” he says, “I can express what Duck is feeling.”As Hills’ two children grow, he finds himself drawn to how kids treat each other. “I didn’t tolerate meanness or injustice as a kid,” he says. In Duck, Duck, Goose (Schwartz and Wade, 2007), Hills creates a friendship triangle by introducing a new duck named Thistle. Together Duck, Goose, and Thistle give Hills’ observations a voice and provide several conversation starters for parents and children.Hills writes from his home in Brooklyn, New York. Some days he doesn’t write at all, but tries to stay receptive to what he’s experiencing. “Most of my ideas come to me when I’m not looking,” he says. “It’s hard to get yourself to a point where ideas are out there and you can grab them.”from patriciamnewman/hills.